Ontdek de historische geneugten van Ile de la Cité, een klein eiland aan de Seine, tijdens deze 3 uur durende rondleiding door Parijs. Met een gids bezoekt u de topattracties: de Notre-Dame, de Sainte-Chapelle en de Conciergerie, zodat u meer te weten komt over de betekenis en gebeurtenissen die zich op elke locatie hebben afgespeeld. Het eiland is een van de mooiste locaties van Parijs, dus mis deze kans om er meer over te weten, inclusief het duistere verleden, niet te missen. Skip-the-line toegang en speciale toegang om de torens van Notre Dame te beklimmen zijn inbegrepen. Felix, our tour guide was great! He was knowledgeable, and could bring history to life. He also has a million dollar smile. I went on this tour because of Notre Dame church which is beautiful but unfortunately we couldn't climb to the tower because the office couldn't get the tickets so they said we will get a refund and we can come back the next day and buy a ticket and go on our own ( which i doubt anyone from the froup did ) . La chapelle was inetersting also la Conciergerie. We had the most wonderful day on this tour. All three attractions are fantastic and each was made more interesting by our very enthusiastic and knowledgeable tour guide 'Adam'. We were in a small group and were amused and involved all the way through. 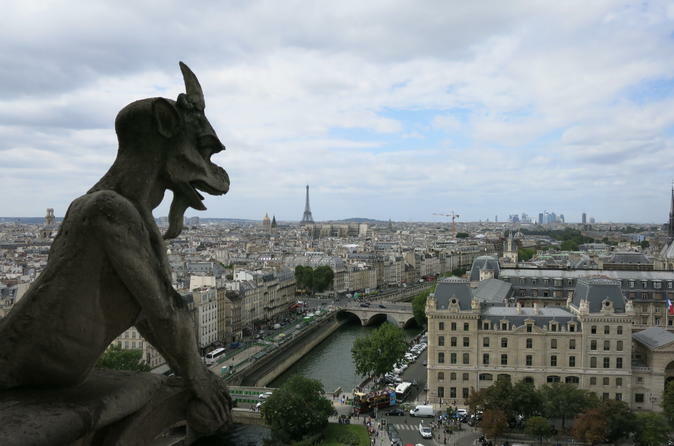 Take the time to go to the top of Notre-Dame, I almost didn't and am so pleased I did, the view is amazing and well worth the huffing and puffing of the steps. I would highly recommend this tour even though it is an early start. We met our guide at 7.45am, our tour being at 8am which was an early start, but was a good early start to our walk around Paris for the day, with the tour over before lunch and lots of the day left to continue exploring Paris! Notre-Dam is just beautiful and a must to visit. A guide is good to have to explain things we would have not known. We then walked to Sainte Chapelle, with more history explained to us. Well worth seeing also - just beautiful! The prison was next with another short walk - all 3 are close by so there is not much walking - our guide explained so much to us we felt we were in that era! She took us out of our world and for a short time into Marie Antoinette’s world! A definite must to visit also. We then walked back to Dotre-Dame where our guide left us in our skip the line to climb the towers. This you do at your own pace and time. We aren’t young, but managed the hundreds of steps to the very top quite well! The view is magnificent from the top, with many many photo opportunities of Paris. A well worthwhile, enjoyable tour! Felix was superb. He made the tour through the Notre Dame so much more exciting. His knowledge and interaction with his group is so exciting.This is truly worth it. The extra history and knowledge shared made it special.Thank you so much Felix and super amazing tour. Violet was AWESOME! Approachable, knowledgeable and patient! Will ask for her next time. Don't wait in line for the canned tour...take it with someone who lives and adores it. Well worth the money. Tina was very professional, knowledgeable and fun to be with. Glad I booked this tour. Fantastic tour. Our guide Felix was exceptional. His knowledge and interest in the tour topics was appreciated. I'd strongly recommend this tour. This tour started early morning which was nice so we could plan another activity afterwards. The cathedral is beautiful. The guide was able to give a lot of history on the cathedral and other parts of the island. We saw the place where Marie Antoinette was held before her execution. The only problem we had is the bell tower climb. It was supposed to be front of the line but the rules have changed and we had to select a time after the tour to climb the bell tower. Our tour ended at 11:00 but the next available time was 2:00. We were not able to stay and climb the bell tower because we had another activity planned. We were disappointed that Viator did not inform us of this change ahead of time. Otherwise, take this tour. I simply can't say enough about this tour or the incredible guide we had, Violette. She had an art history degree, and her personal interest and passion for the subject was very apparent and it made the tour simply impossible to be matched. We were spoiled early since this was our first tour of the week, and no other guide came close. I learned more from her than some of my professors in my history classes at a university. 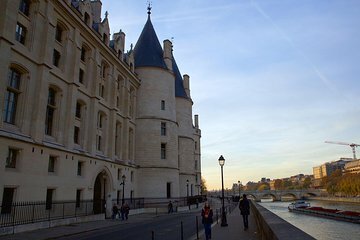 I have visited Paris before, and thought I knew a decent amount about Ile de la Cite, Notre Dame, etc. but it turns out I knew nothing. I left this tour learning so much about not just the isle, but about the politics of the Revolution, Pre-Christian Paris, Roman baths, Napoleon's reign, Joan of Arc, and on and on and on. Her passion and energy were contagious, and she had a very clear love for her city, and every question we asked, she always had an intelligent answer. We would recommend this tour for anyone looking for a truly informative and incredibly inspiring day in Paris. There aren't enough words to describe what a wonderful time my mom and I had, and that's all because of our guide. Definitely sign up for this, worth every single cent.